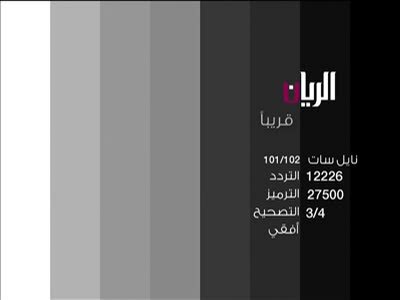 New SID for Al Rayyan TV on 10730.00MHz, pol.H FEC:3/4 SR:30000: SID:10908 ( PID:981/982 Arabic - Clear). Al Rayyan TV (undefined) broadcasts in DVB-S Clear on 12226.00MHz, pol.V SR:27500 FEC:2/3 SID:805 PID:8051[MPEG-4]/8052 aac Arabic. A new channel has started in DVB-S Clear: Al Rayyan TV (undefined) on 10845.00MHz, pol.V SR:27500 FEC:2/3 SID:805 PID:8051[MPEG-4]/8052 aac Arabic. A new channel has started in DVB-S2 Clear: Al Rayyan TV (undefined) on 10730.00MHz, pol.H SR:30000 FEC:3/4 SID:372 PID:1140/1652 Arabic. New PID for Al Rayyan TV: PID:6111/6112 Arabic SID:6106 (12168.00MHz, pol.V SR:27500 FEC:5/6 - Clear). A new channel has started in DVB-S Clear: Al Rayyan TV (undefined) on 10971.00MHz, pol.V SR:27500 FEC:3/4 SID:410 PID:519/720 Arabic. Al Rayyan TV (undefined) broadcasts in DVB-S Clear on 11142.00MHz, pol.V SR:27500 FEC:3/4 SID:372 PID:1140/1652 Arabic. A new channel has started in DVB-S2 Clear: Al Rayyan TV (undefined) on 3764.00MHz, pol.L SR:30000 FEC:4/5 SID:6106 PID:36/6112 Arabic. New PID for Al Rayyan TV: PID:36/6112 Arabic SID:6106 (12168.00MHz, pol.V SR:27500 FEC:5/6 - Clear). New SID for Al Rayyan TV on 12437.00MHz, pol.V FEC:3/4 SR:27500: SID:2 ( PID:203/204 Arabic - Clear). A new channel has started in DVB-S2 Clear: Al Rayyan TV (undefined) on 12475.00MHz, pol.H SR:29900 FEC:3/4 SID:2100 PID:3001[MPEG-4]/3002 Arabic. A new channel has started in DVB-S Clear: Al Rayyan TV (undefined) on 12168.00MHz, pol.V SR:27500 FEC:5/6 SID:6106 PID:6111/6112 Arabic. A new channel has started in DVB-S Clear: Al Rayyan TV (undefined) on 12437.00MHz, pol.V SR:27500 FEC:3/4 SID:3 PID:203/204 Arabic. A new channel has started in DVB-S Clear: Al Rayyan TV (undefined) on 12728.00MHz, pol.H SR:2892 FEC:3/4 SID:1 PID:308/256 Arabic. A testcard identified Al Rayyan TV has started in Clear on 12226.00MHz, pol.H SR:27500 FEC:3/4 SID:2105 PID:156/157 Arabic. Al Rayyan TV has left 12226.00MHz, pol.H (DVB-S SID:2109 PID:191/192 Arabic), it is no longer transmitted by satellite in Europe. A testcard identified Al Rayyan TV has started in Clear on 12226.00MHz, pol.H SR:27500 FEC:3/4 SID:2109 PID:191/192 Arabic.